R110 000 for Cape Town’s big wave surfers! Cape Town big wave surfers stand a chance to win a share of R110 000 (about $16000.00) in the just announced: Rebel Sessions 2011. 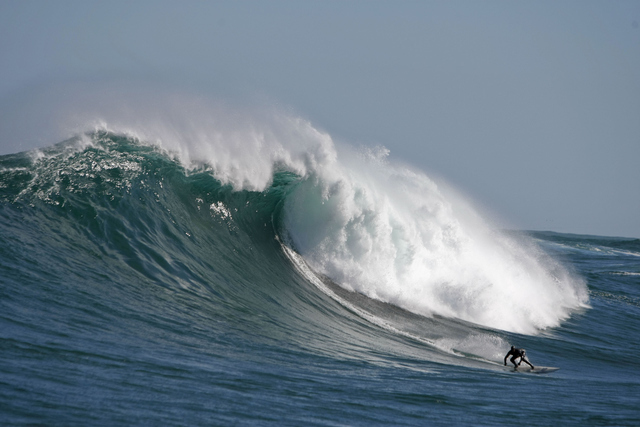 Rebel Media have announced the prize money to be awarded for the best waves surfed and recorded at the legendary Dungeons reef at Houtbay, or the lesser-known offshore reefs at nearby Kommetjie. From July 15th to 22nd October, the committed few who ride giant waves off the Cape of Storms every winter will be filmed and photographed by the Rebel Media crew on the ten best days of surf of 15 feet or over. A panel of three local and three international surfing legends will judge the footage at the end of the period. R50 000 will go to the surfer of the best big wave paddled into, R30 000 for the best tow-in wave, R20 000 for the biggest wave paddled into and R10 000 for the biggest wipeout in either category. Rebel Media will provide specialist big wave camera crews by local production company Fixerfilm on the ten biggest and best days of surfing in the period. Cameras will film the action from the land, from a boat and from a specialized jet ski to get the best possible footage, which will be posted on rebelsessions.com. Ultimately, the footage will be edited into an international documentary. “this is an event that seeks to reward the guys who are out there pushing the limits of big wave surfing, usually when there’s no prize or cameras filming. It’s an event from locals for locals giving them time to pick their days and avoid contest pressure”. The long waiting period and Rebel Media providing the camera crews gives the local chargers whose sessions normally go undocumented, a chance to stand out. But all waves surfed at either of the breaks recorded and submitted will be considered for the prize money regardless of who films or rides them. Rebel Media is a global marketing and media company, who is extensively involved in surfing / extreme sports events and media productions for more than 15 years. Rebel Media also produces the internationally syndicated extreme sports show Rebel TV.